Some trace the origins of this shift to the death of Michael Conrad (Sgt. Phil Esterhaus) midway through season four, leading to the replacement of the beloved Sgt. Esterhaus by Sgt. Stan Jablonski, played by Robert Prosky. The series' influence was seen in such later series as NYPD Blue, Law & Order and ER. In 1982, St. Elsewhere was hyped as Hill Street Blues in a hospital. Season 6: Major changes occurred as Det. Mayo, Det. Garibaldi, Lt. Ray Calletano (René Enríquez), Fay Furillo (Barbara Bosson) and Officer Leo Schnitz (Robert Hirschfeld) were all phased out at the start of the season, and Joe Coffey left near the end. The sole addition was the arrogant and dislikable Lt. Norman Buntz, played by Dennis Franz, who had played a different character, the corrupt "bad guy" Detective Sal Benedetto, in several season 3 episodes. Buntz and Benedetto were doppelgängers. Peter Jurasik played a new recurring character ("Sid the Snitch"), who often teamed with Buntz. In a 1991 interview on Later with Bob Costas, Ken Olin claimed these characters were removed so the new show-runners would receive royalties. Bosson's departure, however, was voluntary. She left after a salary conflict with the new executive producer who, according to the actress, had also wanted her character, Fay, to go back to being a shrewish "thorn in her ex-husband's side". The 34th Primetime Emmy Awards were held on Sunday, September 19, 1982. The ceremony was broadcast on ABC. It was hosted by John Forsythe and Marlo Thomas. In its eighth and final season, Barney Miller finally won the Emmy for Outstanding Comedy Series, it had been nominated and lost the previous six seasons. On the drama side, it was once again all about Hill Street Blues. It set multiple records on the night, including receiving 16 major nominations (winning four), breaking the long-held record (subsequently broken) of 14 for a comedy or drama set by Playhouse 90 in 1959. It also received nine acting nominations for regular cast members, this has since been tied by L.A. Law, and The West Wing. Included in those acting nominations was another milestone, Hill Street Blues received every nomination for Outstanding Supporting Actor in a Drama Series, this achievement has not been duplicated by a comedy or drama in a major acting category since. Another milestone was set by Andrea Martin, who became the first actor from a variety series, in this case Second City Television, to be nominated in the comedy acting field since the categories merged in 1979. Ingrid Bergman won her final award posthumously, for A Woman Called Golda. It was not only the fourth posthumous acting award in Emmy history, but also the second performance ever to have won from a non-Network Syndicated show. The 35th Primetime Emmy Awards were held on September 25, 1983. The ceremony was broadcast on NBC, from the Pasadena Civic Auditorium, Pasadena, California. It is remembered for the vulgar language during the ceremony, much of it from Joan Rivers who cohosted the ceremony with Eddie Murphy. Rivers also wore nine dresses throughout the ceremony. Despite being one the lowest-rated shows of the season, the critically acclaimed first season of Cheers won Outstanding Comedy Series as well as three other major awards. For the third straight year, Hill Street Blues won Outstanding Drama Series, it received at least 14 major nominations for the third straight year, unprecedented at the time, and also received every nomination in the Outstanding Writing in a Drama Series field. Second City Television also garnered every nomination in a category, for Outstanding Writing in a Variety, Music or Comedy Program. NBC dominated the night, on the strength of the shows mentioned, it received 71 of the 128 major nominations, and won 19 of 25 major categories. In its final ceremony, M*A*S*H was once again nominated for Outstanding Comedy Series. M*A*S*H was nominated every year it was on the air, 11/11, winning once in 1974, this record would be tied by Cheers a decade later when it too went 11/11, finishing with four victories. The 36th Primetime Emmy Awards were held on September 23, 1984. The ceremony was broadcast on CBS, from the Pasadena Civic Auditorium, Pasadena, California. The top shows of the night were Cheers and Hill Street Blues. Cheers won its second straight Emmy for Outstanding Comedy Series, while Hill Street Blues made history. It became the first show to win the Emmy for Outstanding Drama Series four consecutive years. This record still stands today, but has been tied twice, by The West Wing and Mad Men. Hill Street Blues also added to another streak. It received at least 14 major nominations for the fourth straight year, winning four. Cheers received the most nominations on the comedy side (10), winning three. Sir Laurence Olivier won the last of his five career Emmys this evening. His win was also the last time a non-Network Syndicated performance won an Acting Award. The 37th Primetime Emmy Awards were held on September 22, 1985. The ceremony was broadcast on ABC, from the Pasadena Civic Auditorium, Pasadena, California. The Cosby Show defeated two-time reigning champion Cheers to win Outstanding Comedy Series, one of three major awards it won. Although it only took home one major award, Cheers did tie the then-record for most major nominations by a comedy series (11), set by The Mary Tyler Moore Show in 1977. In the drama field Cagney & Lacey, en route to winning four major awards on the night, defeated presumed favorite Miami Vice to win Outstanding Drama Series, four time defending champion Hill Street Blues still received nine major nominations, but only won one award. This was Hill Street Blues 18th and final major award, setting an Emmy record for a drama series that still stands. The 39th Primetime Emmy Awards were held on Sunday, September 20, 1987. The ceremony was broadcast on Fox for the first time as the network premiered a year earlier from the Pasadena Civic Auditorium in Pasadena, California. For the second straight year, The Golden Girls won Outstanding Comedy Series. The winner for Outstanding Drama Series was L.A. Law, which, for its first season, won four major awards, and led all shows with 13 major nominations. The winner for Outstanding Drama/Comedy Special, Promise, set a new record with five major wins. This record still stands for TV movies, though it was tied by Temple Grandin in 2010. The Tracey Ullman Show received three major nominations on the night, making it the first ceremony in which the network Fox received a major nomination. 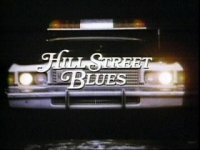 This was the only time that Hill Street Blues wasn't nominated for Outstanding Drama Series in its seventh and last season, also no males actors of Hill Street Blues were nominated (even with 20 previous nominations), only Betty Thomas for Outstanding Supporting Actress in a Drama Series was nominated and did not win, making her the only one in the cast to be nominated in all seasons. NBC continued its dominance of the field, becoming the first network to gain over eighty major nominations (82). Its résumé was highlighted by gaining all five nominations for Outstanding Comedy Series, this had been done only once before (in 1977, but with a field of only four shows) and has not been matched in either field since. Bruce Peter Weitz (born May 27, 1943) is an American actor who is perhaps best known for his role as Sgt. Michael "Mick" Belker in the NBC police drama Hill Street Blues, which ran from 1981 until 1987. Weitz won an Emmy Award for Outstanding Supporting Actor in a Drama Series in 1984 for his role in the series. Charles Maurice Haid III (born June 2, 1943) is an American actor and film director, with notable work in both movies and television. He is best known for his portrayal of Officer Andy Renko in Hill Street Blues. Haid was born in San Francisco, California, the son of Grace Marian (née Folger) and Charles Maurice Haid, Jr. He attended Carnegie Institute of Technology (now Carnegie Mellon University), where he met Steven Bochco. He was associate producer of the original stage production of Godspell in 1971, which was developed at CMU. Haid's acting credits include the 1976/1977 series Delvecchio as Sgt. Paul Schonski, the 1980s series Hill Street Blues as Officer Andy Renko, and the 1980 movie Altered States as Dr. Mason Parrish. In 1984, Haid was cast as "The Fatman" (or just "Fats") in the never released movie The House of God. In 2004–05, he played C.T. Finney, a corrupt New York police captain on the sixth season of the NBC show Third Watch. Haid provided the voice of the one-legged rabbit "Lucky Jack" in the 2004 Disney animated film Home on the Range. Twenty years earlier, Haid had voiced main character "Montgomery Moose" in the pilot episode of The Get Along Gang, produced by Nelvana. He was replaced by Sparky Marcus for the subsequent series. His directing credits include an episode of ER that earned him a Directors Guild Award and nominations for the TV movie Buffalo Soldiers and an episode of NYPD Blue. He was a regular director on the FX series Nip/Tuck. He also directed for the FX series Sons of Anarchy and AMC's Breaking Bad. He is a regular director for the CBS series Criminal Minds, for which he also portrayed serial killer Randall Garner (a.k.a. "The Fisher King"). Gregory King Hoblit (born November 27, 1944) is an American film director, television director and television producer. He is best known for directing the films Primal Fear, Fallen , Frequency, Hart's War, Fracture. He has won nine Primetime Emmy Awards for directing and producing Hill Street Blues, NYPD Blue, L.A. Law, Hooperman and the television film Roe vs. Wade. Hoblit was born in Abilene, Texas, the son of Elizabeth Hubbard King and Harold Foster Hoblit, an FBI agent. Much of Hoblit's work is oriented towards police, attorneys and legal cases. Hoblit has directed and produced the pilot and series of such acclaimed television series such as NYPD Blue, L.A. Law and Hill Street Blues. He also wrote an episode of the latter series. Hoblit received Primetime Emmy Awards for his directing of the pilot episodes of Hooperman and L.A. Law. He was married to actress Debrah Farentino from 1994-2009. They have one child together. "Hill Street Station" is the first episode of the first season of the American serial police drama Hill Street Blues. "Hill Street Station" originally aired in the United States on NBC on Thursday January 15, 1981 at 10:00 PM Eastern time as part of a two-week five-episode limited-run pilot airing on Thursdays and Saturdays. The episode won numerous Primetime Emmy Awards (Directing, Writing, Sound Editing, and Cinematography), a Directors Guild of America Award, a Writers Guild of America Award, and an Edgar Award as well as Emmy Award nominations for film editing, music composition, and art direction. The episode was directed by Robert Butler and written by Michael Kozoll and Steven Bochco. Unlike other high-profile debuts from the 1980–81 network television season that had two- and three-hour premieres, such as Dynasty and Flamingo Road, this premiere episode debuted by itself as a one-hour offering. That season, even some holdovers, such as B. J. and the Bear and Buck Rogers, had multi-hour season premieres. The main storyline involves a hostage situation that arose from an attempted armed robbery. The episode also introduces a host of unique characters. At the time of the debut, Robert McLean described the cast as a "cast of unknowns". Jeffrey Jeff Lewis is an American screenwriter, best known for his work with Hill Street Blues. He earned 8 Emmy Award nominations as a writer and one win as well as 8 Writers Guild of America Award nominations, including 1 win as a writer, all for Hill Street Blues. He was a Yale University roommate with David Milch and recruited him to join Hill Street Blues staff. Michael Conrad (October 16, 1925 – November 22, 1983) was an American actor perhaps best known for his portrayal of veteran cop Sgt. Phil Esterhaus on Hill Street Blues, in which he ended the introductory roll call to each week's show with "Let's be careful out there". He won two Emmy Awards for Outstanding Supporting Actor in a Drama Series for Hill Street Blues in 1981 and 1982. Lloyd Michael "Mike" Warren (born March 5, 1946) is an American TV actor and former college basketball player, best known for playing Officer Bobby Hill on the NBC television series Hill Street Blues. Robert Butler (born November 16, 1927) is an American film and Emmy Award-winning television director. He is best known for his work in television, where he directed the pilots for a number of series including Star Trek and Hill Street Blues. Steven Ronald Bochco (December 16, 1943 – April 1, 2018) was a television producer and writer. He developed a number of television series, including Hill Street Blues, L.A. Law, Doogie Howser, M.D., and NYPD Blue.